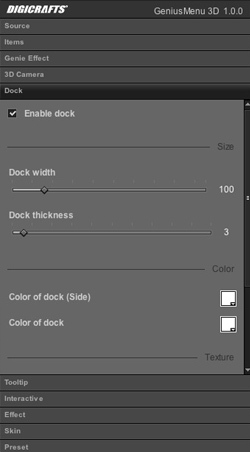 DockMenu 3D makes it easy to add a Mac OS-style dock menu in your flash project. But DockMenu 3D is not just a copycat; it brings many new and creative features. The menu is built using a full 3D engine. For example, you can change the camera angle to better fit your design. Also, it supports cube objects and not just flat icon. Tons of customized styles will unleash your creativity. Supports loading jpg, png, external swf, embed bitmap and movieclips.